Many children with brain and skull base tumors are treated with radiation therapy. Cranial radiation therapy can have significant adverse cognitive effects such as changes to attention, working memory, processing speed, long-term memory, executive functioning, emotional regulation, and social skills. Proton therapy is a new way to deliver radiation therapy. Because proton therapy can better target the tumor and spare healthy brain tissue, it is expected to be associated with reduced neurocognitive morbidity. It takes years for potential neurocognitive effects of radiation to emerge. Given the novelty of proton therapy, little data is available describing cognitive changes after treatment. 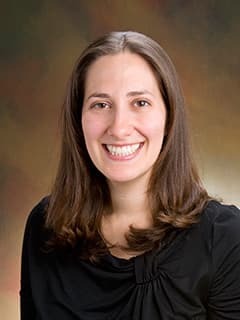 To learn about the effects of cranial proton radiation, Iris Paltin, PhD, is evaluating children prior to proton therapy and then annually/bi-annually after treatment completion. These assessments evaluate thinking and learning in many ways, with specific focus on attention, executive functions, processing speed, and memory. Information gained during these evaluations helps inform future treatment and intervention design. It is expected that pediatric proton radiation therapy will be associated with preserved long term functioning compared to conventional (photon) radiation therapy. We also hope to identify individual risk and protective factors that influence the emergence of cognitive late effects. We also collaborate with other institutions to compare the neurocognitive effects of proton and photon radiation therapy.